I was asked to design and build a custom table to work in harmony with the Eagle’s Landing location in Oconomowoc, WI. The piece will greet people as they tour the model of the new development. This table is made of welded steel with a blackened oak top and black wood inlay along the perimeter of the surface. Thank you to Maureen Stapleton of Stapleton’s Realty, Oconomowoc for the opportunity to showcase this work. Check out the TABLES page to see more! 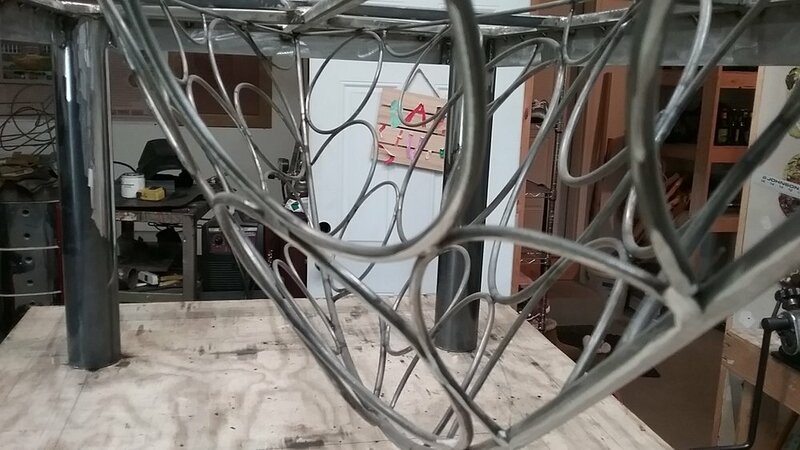 I have been working on a really exciting project lately: Ed Gilbertson of Gilbertson Stained Glass in Lake Geneva, WI has commissioned me to create a sculptural steel dining room table. He has a beautiful granite slab that will be the table top when my work is complete. We collaborated on the overall design and I recently began working on the underside of the piece which is very reminiscent of a boat hull. I’m really enjoying the interplay between the large, massive legs and the more refined, elegant circular motif in the hull. More to come! The Purple Door Ice Cream Custom steel patio set was a big hit this past summer as people enjoyed the delicious treats of Purple Door in the Milwaukee summer sun. Head down to get some ice cream and check out the chairs and table before they are stored away for the winter. Happy to say that with the upcoming Spring weather, the customers at Purple Door Ice Cream in the Walker's Point, Milwaukee Neighborhood will be able to enjoy their delicious treats while sitting on the custom made steel furniture set that I was commissioned to build. Please stop by and check it out! So happy to share that my tables will be on display and for purchase at this year's NARI Home and Remodeling Show @ Wisconsin State Fair Park Expo Center....Special thanks to GMH Construction for hosting my work in their beautiful space. I have been fortunate to have the opportunity to create a patio set of custom steel furniture for Steve and Lauren Schultz, owners of Purple Door Ice Cream in Milwaukee's Walkers' Point neighborhood. The set was designed in collaboration with Lauren and Steve to reflect the rich diversity of the neighborhood in Walker's Point from its early founding as a fur trading post to its current flourishing and active cultural scene that it is today.